White chicken chili is one of my favorite pressure cooker chicken recipes for cooler weather. It is quick and easy to make in your Instant Pot or other brand of pressure cooker. Now that fall is here, it’s the perfect time for a hot, spicy bowl of chili. My favorite chili is White Chicken Chili. I’ll often order it at restaurants, but I’ve never made it at home until now. Using a pressure cooker or Instant Pot, you can make a quick chicken chili recipe that tastes like it’s been simmering in the slow cooker all day, but it cooks in only 5 minutes in the pressure cooker. 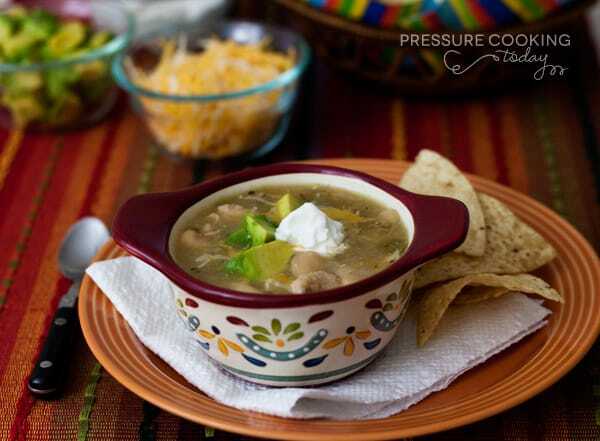 I combine several recipes to create this pressure cooker white chicken chili, including my pressure cooker Chicken Tomatillo Soup recipe. It’s become one of our favorite soups. The tomatillos in the salsa verde add a nice bright, fresh flavor to the chili. An Instant Pot is one of the most popular brands of electric pressure cookers. They are easy to use and your Instant Pot can help you create this delicious White Chicken Chili! I used precooked chicken in this white chicken chili recipe. I like to cook a big batch of chicken and put it in the freezer to use later. You can cook it in the pressure cooker or throw a bunch of chicken breast on the grill. Then dice or shredded the chicken and freeze it in one cup portions so it’s ready to use for quick lunches or dinners. Of course if you would rather, you could also saute chopped chicken in the pressure cooking pot until it’s no longer pink after you’ve sauteed the onions and garlic, and then just proceed with the recipe as directed. I hope you enjoy this easy pressure cooker white chicken chili recipe! Add chicken, chicken broth, salsa verde, green chilies, cumin, red pepper flakes and beans to the pressure cooking pot. Lock lid in place, select High Pressure, 5 minutes cook time and press start. When timer beeps, turn off pressure cooker, wait 5 minutes, then do a quick pressure release to release any remaining pressure. In a small bowl, dissolve cornstarch in 3 tablespoons water. Select Simmer and add cornstarch mixture to the pot stirring constantly until chili thickens. Add salt and pepper to taste. Served topped with sour cream, diced avocado, tortilla chips, and shredded cheese. 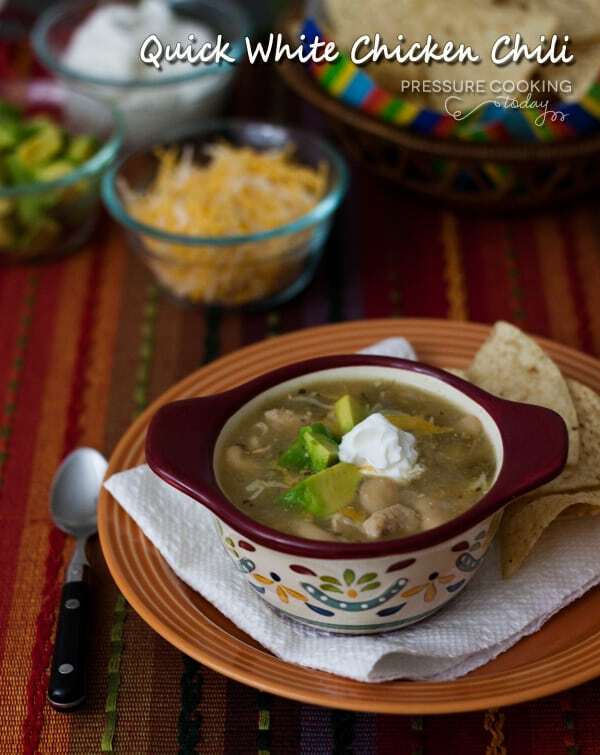 Two other easy Instant Pot chicken chili recipes you might like Instant Pot Chicken Chili Verde, from Two Peas & Their Pod and Instant Pot White Chicken Chili from Eat. Drink. Love. What setting is the equivalent of simmer on the Instant Pot? I’m making this today – my first dish in the IP – and I have no idea which option to use for summer, since it is not on my Duo Plus. Hi Amy – to simmer on the Instant Pot you use saute adjusted to low. So press the saute button until the light is above low. Enjoy! Why the corn starch? Can potatoe flakes be substituted? The cornstarch thickens the broth. I haven’t tried potato flakes, but others have used them in other recipes. I am making this recipe in large roasters for a group of 64. Are there any suggestions you can give me to help make it a success? Hi Paula – a great, easy choice for a crowd. Since all the ingredients except the onions are already cooked, I would saute the onions and garlic first then combined all the ingredients in the roasters and just heat it on a low heat 275° for an hour or so, stirring occasionally. If you only have dry beans (not canned) is there a way to adjust the recipe? Do I still have to soak the beans overnight? I am very new to pressure cooking, having just received an instant pot as a Christmas gift, so I am still learning a ton. Hi Sue – you can use dry beans in this recipe if you do a quick soak. I explain the the quick soak in the notes in this recipe. http://www.pressurecookingtoday.com/pressure-cooker-baked-beans/ Make sure your beans are tender before adding them to the recipe. You can saute the beans after the soak if needed. Enjoy! Hi Leslie – I wouldn’t suggest cooking this recipe in the slow cooker all day. I think your chicken would be very overcooked. Could you make it the night before and just reheat in when you get home from work? My son doesn’t care for tomatoes so this is just the meal for those cold weather days like we had today. I followed the recipe to the letter but used Bush’s white chili beans in chili sauce without the usual drain and rinse. Good hearty meal that warms you up on the in and outside. So glad you enjoyed it. Perfect for cold winter days. I like your change. I’ll have to look for those beans. This chili looks wonderful. Just wondered what brand of salsa verde you use? I love the Trader Joes brand and think it would work great here. Thoughts? Ok just wanted you to know I just made this and it is very tasty. Used the Trader Joes salsa verde (12 oz jar) and it has great flavor! I think the TJ’s brand is a little on the salty side so 12 oz seems just right as it is pretty flavor packed. Also thickened with half the cornstarch and a little less than 2 Tablespoons cornmeal. I love your recipes and use them often–thank you very much!! This recipe is terrific on several counts; first and foremost, it’s delicious. Second, it’s healthy. Third, it’s easy to prepare. I think it would appeal to a wide variety of tastes since it’s not too spicy, but still interesting. Bravo! I’ve already had requests to make it for some special events. Hi Alyssa – you could definitely use raw chicken. I’d just cut it in to small bite size pieces and not change the cook time at all. Enjoy! Wonderful recipe….I followed it to the letter except I added 1/2 diced jalapeño. I think next time I will add 1 more cup of chicken and 1 more can of beans to make it less soupy and more like a chili. This is soon ooh good. Every time I make it several people are asking for the recipe. Thank you for sharing it with us. Thanks Sylvia for letting me know it’s become a favorite! This is a GREAT recipe. So simple and the flavor was great. I only modified a little by adding some extra cumin and a larger can of green chiles. Served with Mexican Sour Cream and Oaxaca cheese. This recipe was a big hit with the whole family. Thanks Aaron – so glad you loved it. Those sound like wonderful additions. Barbara , My friend makes her own version of white chicken chili and I have to get her recipe and try it as well. I ‘ve been dying to makes this all month and I hope to do that this month. Also, your recipe here sounds wonderful too! Is this a very hot soup? I’m thinking with the chilis, salsa verde & chilli flakes – it might be too much for me – I LOVE heat, but often have “burning mouth syndrome” so, I’m limited. What do you think? Hi Joy – No the chili isn’t very hot. The salsa verde was mild and the chilies were mild green chilies. If you were worried about it you could leave out the green chilies and just use half of the salsa verde and chili flakes. You know what you need to try next! with flavors your are already working with I know you can turn a 3 hour stew into a quick flavor rich meal. Pork, onion, hominy, oreango…Maybe some green chilies and or tomatillos. I know this would work great in the pressure cooker. Hi Becky – I actually have a pork shoulder in the fridge right now that I plan to cook tomorrow to make a Pork and Hominy Stew. Not quite Posole but close. Look for it next week. Thanks! The calendar says October but today the outdoor thermometer is saying 82 degrees-whaaat? I know it’s short lived, so will be saving this recipe for the cool down that will be coming soon enough. I always seem to think red when I think chili-time to step outside that box and GO GREEN! That looks delicious. You have the prettiest dishes and bowls too…….I have dish envy! Thanks Barbara-and you’re not the only one who needs a second freezer….I can’t believe how full ours is with just 2 people in the house. I’d be lost without it, that’s for sure. I sort of think 82° is the perfect temperature. 🙂 Thanks for the compliment on the dishes. I picked up this cute little bowl at Kohls. Definitely need to go Green. This soup is a go-to recipe for us, always a winner, winner chicken dinner! But wouldn’t you want to use the pressure cooker to make the beans? so much cheaper and less sodium too. Hi Melissa – you’re right. It would be a great idea to make a big batch of beans, use what you need for this chili and then freeze the rest to use later. Just like I do with the chicken. I really need to get a second freezer.